“A Dream Deferred,” the title and theme of this project, focuses on the incomplete citizenship of the Chinese and Indians of Malaysia. This project creates a parallel with the similar subjectivity of African Americans in the United States which led to a new era of American history, the 1960s Civil Rights Movement (click to see video). 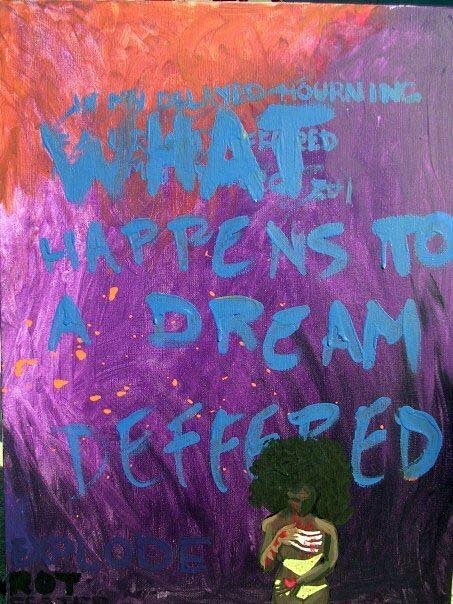 The concept of the deferred dream is taken from Langston Hughes poem titled “Harlem” (1951) in which Hughes poses the question, “What happens to a dream deferred?” This question, in this context, refers to the dream of nation. Similar to African Americans in the 1960s, Chinese and Indian Malaysians are faced with the problem of a national government that boasts unity and simultaneously undermines that unity through the creation of a national identity constructed on the basis of racial dominance. The Chinese and Indian ethnic groups are subsequently denied privileges set aside for members of the Malay race, also referred to as bumiputera or , collectively, bumiputras. The bumiputras have been established by the government as the rightful inhabitants of Malaysia—in fact, bumiputera is loosely translated as “sons of the soil.” The term has not only been adopted as an official term by the Malaysian government, but is also included in the Constitution of Malaysia as article 153 which grants Malays a “special position” in Malaysian society. This distinction of indigenous versus non-indigenous has created a polarity. The Malaysian government after independence sought to establish Malaysia as the “land of the Malays” and created a national identity that excludes the Chinese and Indians. As a result ‘non-Malays’ were positioned and remain as ‘Others’. This project analyzes nationhood, citizenship, and belonging in Malaysia through literary analysis. The main text is Shirley Geok-lin Lim’s novel Joss and Gold (2001). In the novel, Lim addresses concepts of nation, national identity, and ‘othering’ from the perspective of a Malaysian Chinese woman in 1960s Malaysia during the riots of May 13, 1969 (click to see video). In order to create the aforementioned parallel between ethnic relations in Malaysia and racial relations in the United States, Lorraine Hansberry’s play A Raisin in the Sun (1959), which acquired its title from Hughes’ poem “Harlem,” will be used to make connections between Malaysia and 1960s America. The deferred dream of which Langston Hughes speaks and Hansberry critiques is the dream of nation—more specifically, the dream of a multicultural nation. However, Hughes and Hansberry demonstrate that this dream is actually three-tiered. The higher tier involves the realization and actualization of nation. The middle tier focuses on the American promise and promoted legacy of opportunity, opportunity for education and economic success. However, as Hughes and Hansberry argue in their work, benefiting from such opportunity is reliant on the freedom to pursue these opportunities. This freedom, according to Harlem Renaissance artists, social activists, and Civil Rights leaders in 1960s America, could only be obtained through full inclusion in society, or citizenship. Hughes and Hansberry saw the denial of such privileges as a contradiction to the American dream. Despite claims of freedom, equality, and justice for all, citizenship was still primarily most fully enjoyed by middle and upper-class white males even in the 1960s. Citizenship is vital, as it provides an individual with privileges such as voting and other freedoms that separate citizens from non-citizens. Therefore, the denial of citizenship relegates individuals belonging to a nation to the position of second-class citizens or ‘Others’. Therefore, the final, basic tier of the American dream is based on the idea of equality; only by treating individuals as equals with access to the same rights and privileges could blacks acquire citizenship. Because America propagated unity yet reinforced division through racial othering, the United States, like Malaysia, included individuals only for the purpose of creating a dichotomy of self and other. That is, the citizenship of the dominant group is defined in relation to the lack of citizenship among excluded groups; or, as Deborah L. Madsen describes it, a space is created where the other can “live but cannot belong” (Madsen, 2006; pg 118). Ieng H. Ang refers to this concept as ‘inclusion by virtue of othering‘ (Ang, 2003; pg 37). According to Hughes and Hansberry, this contradiction results in the collapse of the three-tiered structure (equality, citizenship, and nation) that is the American dream. Without equality, which enables citizenship, nation is unobtainable or, for Langston Hughes, it is “a dream deferred” as he writes in his poem “Harlem.” However, “Harlem” also provides several examples of what could happen to a deferred dream. Hansberry’s play title depicts one of Hughes’ examples: “A Raisin in the Sun.” Hansberry’s play portrays a black family in urban Chicago as they tackle with the fear that their dreams could “dry up like a raisin in the sun” as a result of the lack of opportunity and freedom for blacks in 1960s America. Similarly, Lim provides an example of what happens to a dream deferred within the context of Malaysia and Singapore. At the close of the poem Hughes asks of the dream deferred, “…does it explode,” of which it can be said that Lim’s novel depicts the “explo[sion]” of the dream through the violence of the racial riots of 1969, weakning Li An’s hopes for a unified Malaysia. However, in addition to issues of race, Hansberry and Lim argue that there is more than one kind of other created via exclusionary practices related to nationhood, citizenship, and belonging. The construction of a postcolonial identity in America and Malaysia, according to the texts of Hansberry and Lim, must also include the experience of women and those deemed lower class. Inclusion and equality, as these texts argue, are the only means by which the dream of nation can be realized and ultimately actualized. The dream is therefore deferred or “delayed” by such practices of exclusion. Furthermore, these texts argue that exclusion exists in many forms and, in the case of America and Malaysia, ‘inclusion by virtue of othering’ is still exclusion. Therefore, this project argues that Hughes’ “dream deferred” refers to the lack of citizenship among the disenfranchised, and examines how racial, gender, and socioeconomic inequality intersect and, ultimately, defer the dream of nation.